Here are a few recent blog posts worth reviewing. Google recently provided some additional details about their PHR solution at HIMSS. Several bloggers talk about it. I just found a blog called Pioneering Ideas by someone at the Robert Woods Johnson Foundation that does some great work around healthcare. Comments about the recent articles on the shortage of physicians in the US on Our Own System. If you care, there is lots of discussion out there about Jarvik (promoter of Lipitor) and Pfizer pulling his sponsorship after he was shown to be misleading. Pharma Marketing Blog is a good place to start on this. I will leave you with one last one which is a good analysis of how WalMart will affect US healthcare. Now, just the other day, I commented that I did see much talk about YouTube in healthcare. In the past 24 hours, two things have come to my attention on this. Allscripts posted a video on YouTube (see below). I must admit that one of my favorite things to do is give presentations. I used to do a lot of webinars at Express Scripts and have done a few others as a consultant. 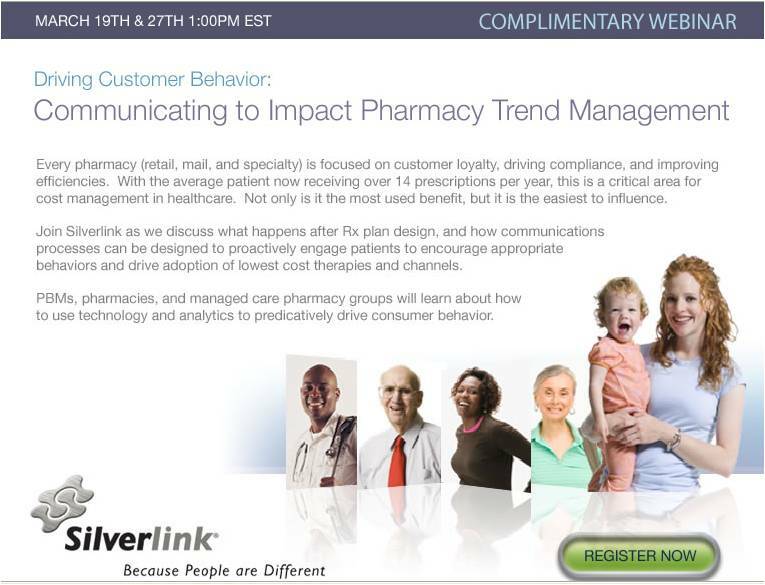 So, with that, I am really excited to schedule my first webinar as a Silverlink employee which I am going to do on my favorite topic – pharmacy trend management (i.e., brand-to-generic, retail-to-mail, utilization management). So, if you’re a managed care company, PBM, or pharmacy that is interested, sign up for the event. I will talk about some of the common myths in driving patient behavior, talk about how to use speech recognition technology, and share some lessons learned and results and ROI examples. I can’t post HTML here so the link below won’t work, but you can click here to register. Thanks. I am clearly not a clinician and haven’t done the research on this topic, but I find it interesting. I likely would have let it slip by me except when I picked up the USA Today on Tuesday I saw a full-page advertisement titled “Are we poisoning our kids in the name of protecting their health?”. It caught my attention so kudos to the designer. So, I read the advertisement and went to the website for Generation Rescue to learn more. From the advertisement, it points out that the autism rate in the US in 1883 was 1 in 10,000 and in 2008 is 1 in 150. That is pretty scary. When I was a kid, I don’t remember knowing kids with autism or ADD/ADHD or peanut allergies or lots of other conditions. Today, I know and have friends with kids with each of these conditions. It certainly is more prevalent (or more diagnosed). 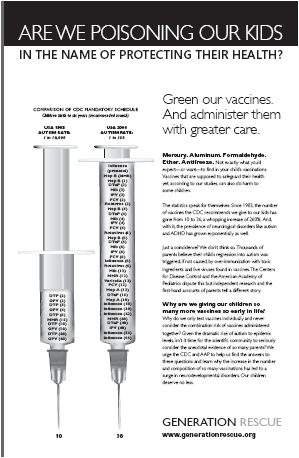 The point of the advertisement is that we have increased the number of vaccines we give our kids from 10 to 36 since 1983 and that the over-immunization with toxic ingredients (mercury, aluminum, formaldehyde, ether, antifreeze) and the live viruses have caused this. Of course, the Centers for Disease Control (CDC) and the American Academy of Pediatrics dispute this. I don’t know the answer, but I know that it’s not easily going to get resolved and no magic trial like the show is going to resolve it. It’s not different than many issues in healthcare where there isn’t great comparative data and things are not black and white. Anyways, watch the show. It’s good. On what the right answer is. I don’t know. I think this is an evolving role in healthcare. Mention CMO to most people and they will think you are talking about the Chief Medical Officer. In some industries this has spun into several roles whose titles might include Chief Innovation Officer, Chief Experience Officer or some other title. Apparently, this is one of the shortest tenured jobs with CMOs in the top-100 consumer branded companies staying in the role for 23 months (compared to 54 months for CEOs). This is according to SpencerStuart as talked about in a Fast Company article from June 2007. Of course, everyone has an opinion on marketing. Think about how much fun it is to brainstorm brand positioning or a new tagline. With a down economy, marketing faces a different type of scrutiny. Often in a short-sighted way, but it is an easier area to reduce than IT, operations, sales, etc. So, what will a tight economy bring…a focus on ROI based marketing with a continued emphasis on marketing analytics and reporting. The traditional, fun marketing of the movies where it is all about glitz and TV advertisements won’t go away, but I think you will continue to see a more pragmatic focus on what the company gets for the time and money spent on different programs. I found an interesting USA Today Snapshot on Tuesday (2/26/08) that listed out what parents want healthcare providers to discuss with adolescents. They all seem like things that the parents have a huge role in influencing and driving. I am not sure if its good that parents are involving the providers or a sign of them not wanting to take on the challenge themselves. We talk with our young kids about food and exercise all the time. Just getting back from the first day of my first PBMI conference. Very pleased. PBMI was bought in the past 2 years by PSG (Pharmaceutical Strategies Group) which interestingly has numerous ex-Express Scripts people working there. Talked about DIY (do it yourself) Doctors as a group of people who use the Internet to self-diagnose and treat MDs as an ATM (here’s is what I need from you). Described the group as mostly woman and typically younger. Linked the growth in OTCs from $2B to $15B to this trend. Said 3/5 people worry about hospital errors. 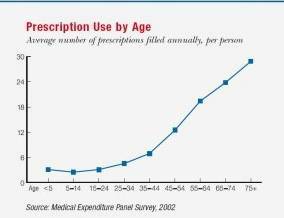 Said young people today think of being on prescriptions as normal. Talked about the “30 Winkers” or 16% of adults that get less than 6 hours of sleep a night. Sleeping only 6 hours a night increases your probability of being obese by 23% and if you only sleep 4 hours then it goes up to 70+%. Talked about looking for microtrends versus fads. Said they might have a microtrend spotting competition on their website soon. There was a VP of HR who talked about the importance of communications around benefit information. Repeat the message but change it so you don’t de-sensitize the audience. Called Therapeutic MAC a “draconian” benefit structure. Showed a sliding scale of programs which a company could use to influence trend ranging from low impact on consumers and low savings potential to high on both. Here are a few from low to high. I did think their idea of a benefit design where generics and mail order prescriptions don’t count against your deductible was interesting. I was a little surprised when he mentioned (without discouraging) clients offering generics at $0. The economics (every time I modeled it for clients) don’t work since you have 50% of people getting generics and paying a copay which you just lost. You would have to improve generics significantly to even breakeven. I (and many people I asked) was surprised with his response to the question of what was a “significant” difference in copays between brand and generic to drive behavior. His answer was $15-$20 which he said was based on what pharma believes is important to get rebates. I did like the fact that they had clients fund a free first fill of OTC Zyrtec to promote moving to the OTC rather than another Rx. He walked through some of the great statistics they have had from their MyRxChoices web tool. Versus a control group, those that got a letter encouraging them to go to the web and used the website. 58% more likely to change to lower cost drug or channel. 51% conversions from brand-to-generic. He also talked about the importance of rebates in PBM pricing which seemed out of place in the generic discussion. Would / could we ever get to an individualized benefit which allocated X dollars and allowed the patient to choose what was included (e.g., tatoos)? What would be the implication for recruiting / hiring if we could create a healthcare cost index similar to a credit score that didn’t tell potential employers what your medical conditions were but gave them an estimate of your medical costs? What are the implications of driving consumerism to web tools which patients use at work when more and more companies use monitoring tools to track keystrokes and web visits? Will they accidentally learn about private healthcare information? I think this is pretty big news. The study that came out over the past few days in the UK has gotten lots of attention. I listened to Dr. Gupta talk about this on CNN this morning validating it although with caveats about drilling into the data. I also talked with a retail pharmacist last night about it. Obviously, with something like 100M antidepressant prescriptions per year, this should be a big deal. The study showed that for those without severe depression a placebo had the same effect as an antidepressant. I know some pharmacists that used to joke about simply telling patients to walk around the block, but their point was that exercise can also have a positive effect on those with depression. This will be an interesting one to see how it plays out. Obviously, if you take an antidepressant, don’t stop without talking to your physician. And, I am sure this isn’t done. The manufacturers aren’t going to let this go away. BTW – The WSJ Health Blog has a good dialog of comments going about this study. Are You Using Your Clickstream Data? Healthcare companies have spent millions (maybe even 10s of millions) of dollars building out self-service platforms on the web. Based on data from the Service and Support Professional’s Organization, only 44% of the time that customers use self-service are they successful. That is of course of the individuals who try the self-service. A Harris Interactive poll found that 89% had difficulty with web self-service. That seems pretty pathetic to me. There are lots of different solutions. For example, you could use a virtual agent (e.g., CodeBaby) to help guide the individual through the process. You could use NLP (Natural Language Processing) technologies to make the website more intuitive (e.g., Knova). In most healthcare companies, web utilization is okay. I don’t think I have met one with over 20% registration (much less utilization). Of course, we know that isn’t because patients aren’t using the web for healthcare. Just look at all the tools out there and the massive investments by WebMD and RevolutionHealth. But, I have yet to meet a large healthcare organization that can tell me much about their web utilizers and that has integrated that data into a total CRM (Customer Relationship Management) approach. 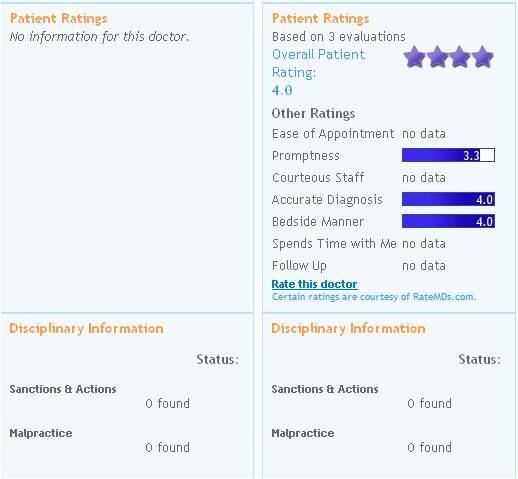 How does web utilization map against your high cost patients? For patients that are constant web utilizers, do you push them to the website rather than send them printed materials? And, one of my favorite questions and pet peeves is whether the CSRs (Customer Service Representatives) have the ability to co-browse. For example, if I am stuck on the website, can they see where I am and help me get to the right section. In some cases, the CSRs don’t even have Internet access and have never been on the website. Hard to drive self-service if the agents aren’t on board. Another thing I have looked at before…why not offer a different cost structure to employers or others if they achieve a certain rate of self-service? Your costs as a MCO or PBM would be lower. Your ability to influence behavior would be lower. It seems like there was a huge push to drive adoption when this was new, but I don’t see it as much now. Where is the campaign to drive adoption with the incentives? The economics haven’t changed and companies continue to invest, improve, and have spent real money on these very cool and often helpful technologies (even if not necessarily intuitive). From a KMWorld July/August 2007 article/advertisement about eGain, their CEO, Ashutosh Roy, gives a list of several best practices and makes the point that “customer service has emerged as one of the few sustainable differentiators in today’s hyper-competitive markets.” How true that is in the healthcare world. Take a proactive approach to customer service. Leverage online channels as part of a unified customer interaction hub. Empower your agents and customers with knowledge. Align metrics with goals and business strategy. No. It’s not my term or even a company term. I am not sure who came up with it, but it was actually used in a published study from 2001. Obviously, given Silverlink’s historical focus, these kind of external validations are important. I cited the one on exercise from Stanford a few months ago. Design: 272 diabetes patients using hypoglycemic medications in randomized 1-year study. Bi-weekly ATDM health assessment and self-care education calls. Nurse educator followed up based on assessment reports. Automated survey measured self-care, symptoms, and satisfaction. Outpatient service use was captured. Glycemic control was measured. Results: intervention patients reported more frequent glucose self-monitoring and foot inspections. Intervention patients were more likely to be seen in specialty clinics and have had a cholesterol test. Intervention patients reported fewer symptoms of poor glycemic control and greater satisfaction with their healthcare. Conclusion: intervention improved the quality of VA diabetes care. Obviously, if you’re very interested in the topic, you should read the article to get all the finer points. My takeaways are that if this technology worked in 2000 then it should be even more effective now. There have been lots of improvements. Additionally, we all know the costs of diabetes (and many other diseases) and the cost of using nurses as the primary means of follow-up. Health Strategies Group is a good analyst group that focuses on healthcare. They produce good quality reports primarily for pharma. In 2004, they put out one about the PBM in 2010. While I am on my way to the PBMI conference, I thought I would revisit it to see some of the interesting points and what has come true. They presented several scenarios (based on input from a panel of people from the industry) so some observations will run opposite each other. Panelists were from ACS State Healthcare, Caremark, Express Scripts, Medco Health Solutions, MedImpact, NMHCRx, Prescription Solutions, and RxAmerica. 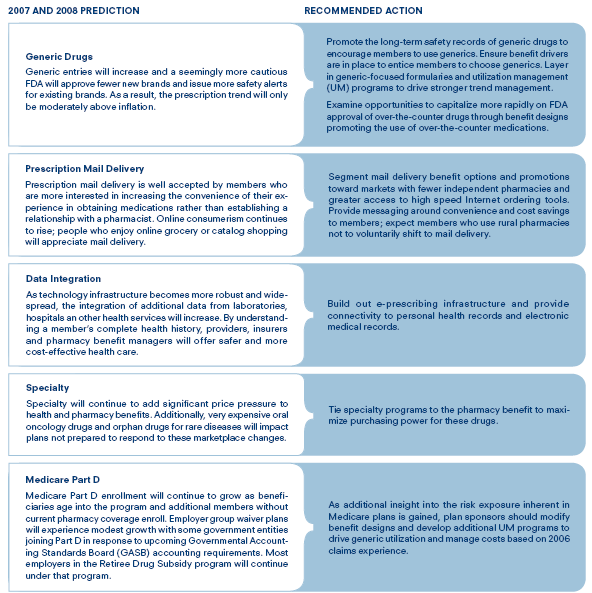 Payers may increase their use of cost-control strategies regardless of consumer desires. Improved market conditions my decrease focus on cost and trend management and shift focus to outcome quality. Changes in power, skyrocketing costs, or inadequate funding my move Medicare from a public/private partnership to a government run program. Consumers may reject their new role of taking on more healthcare responsibility due to lack of interest, cost, confusion, or a perception that it is the employer’s responsibility. I think a key quote at the end about PBMs (which was a sign of the times) is as follows regarding segmenting the population. The segments proposed were Outcome Seekers, Lifestyle Optimizers, Cost Managers, and Non-Users. I think this has changed over the past few years. Obviously, we can risk a nation of people who fail at their healthcare and end up bankrupt, sick, and dependent on the government to bail them out. It’s unrealistic to believe people are rational and use all available information to make consistent decisions. Reminds me of my previous points about loss avoidance versus savings. We need to make fewer decisions. He says there are two that matter: (1) “how much of your wealth you want to put at risk” and (2) “how much risk you want to take with it”. Later, in the same magazine, Jason Zweig has an article titled “Your Money and Your Brain” which is excerpted from the book by the same name ©2007. In our recent press release, we had a quote from IDC that I think is relevant to all of you that read this. There is a nice article that appeared in the latest Managed Healthcare Executive magazine about non-compliance with a focus on behavioral health. Mari Edlin is the author and has written numerous articles for them. I bring it up both because I talked to Mari and got a good quote from her in the article, but also because I think it is such a great example of why patient communications are so important. Although we would all like to believe that we pay attention to all the details of the product information (i.e., side effects), the reality is that we become much more aware of the medication once we start taking it. I believe some compliance issues could be addressed by quick follow-up with the patient. For drugs which take time to take effect, right after the patient begins therapy, reach out to them and remind them that it can take time for the effects of the drug to take place. Or, if it is a drug with significant side effects, reach out to them and remind them of the benefits of sticking with therapy so that they don’t give up due to the side effects. Or, in other cases, they may need to titrate to a different dosage so reach out to them and capture some information about how their feeling on the medication. From the facts I pulled from PharmacySatisfaction.com a while ago, the number one reason for non-compliance was “I forgot”. Combine that with the Caremark report showing that only 25% of people with a disease actually end up on the medication, and you have a real issue for us to address. I think for people with depression, ADD, bi-polar disease, and other behavioral health issues this has the added complexity of using controlled substances and medications that ultimately are affecting your mind. “Medication adherence is driven by two significant factors,” says George Van Antwerp, vice president, outsourcing and professional services, Silverlink Communications Inc., a Boston-based company providing outreach to patients in their homes. “First is the patients’ view of prescriptions and belief in their ability to improve their health. Second, there are the experiential impacts of the regimen, such as realizing an immediate gain in health, the complexity of the therapy, the magnitude of the side effects and the cost to the patient. As you may know, Prime Therapeutics is a PBM headquartered in Minneapolis that is owned by a group of BCBS plans. I just had a chance to read their Drug Report this past week. As I have talked about Caremark, Express Scripts, and Medco, I thought I would share a few comments and highlights here. I was surprised by a 2004 Rand and BCBSA study they quoted saying that “approximately 70 percent of survey respondents cited the Internet as their main source of health information” thereby supplanting the role of the personal physician as the primary source. Given the focus on wellness across the industry, I found their list of common components and incentives that are used in creating a wellness program to be a good, quick checklist. I couldn’t figure out two things that were either “corporate DNA” opportunities or something different about their pricing and plan designs. They also said that their utilization was only 10.65 in 2006 which would be lower than most numbers that I have seen. They do a good job of explaining some of the generic scenarios in the industry as people try to get that small advantage. Several generic companies launched their products ‘at-risk’, which means that the FDA has granted approval to their product prior to the expiration of a patent that is contested in court, but after all applicable exclusivity periods have ended. These ‘at risk’ generics, including generics of Biaxin®, Plavix®, Toprol XL® and Wellbutrin XL®, are subject to large penalties payable to the brand-name drug manufacturer if they lose pending lawsuits. Citizen Petitions Brand drug manufacturers, or their agents, frequently use Citizen Petitions in attempt to slow down the approval of generics. These are not legal proceedings in the typical sense, as they usually do not involve specific protection of a patent. The FDA must make a ruling on a Citizen Petition before it approves a generic, and this frequently takes a significant amount of time. These products are currently involved in Citizen Petitions: Lovenox®, Concerta®, Catapres TTS®, Skelaxin®, Vancocin®, Miacalcin® and Flovent®. With authorized generics, the brand-name drug manufacturer makes its own generic version of its own brand-name drug. By doing this, they can reduce the profit a first-to-file generic company reaps during generic exclusivity periods, which could discourage generic companies from entering the market. Another pressing issue, which has also been around for several years, involves agreements between brand and generic companies. These agreements end litigation and keep generics off the market for a period of time, but still may allow generics on the market before all patents have expired. Sometimes these agreements involve payments to generic drug manufacturers in an effort to delay the release of the generic product. The other thing that I thought was a good summary in their document was their predictions for 2007 and 2008. If you are a Medicare provider, you might be interested in a conference Silverlink is hosting on Coordination of Benefits (COB). It is open to potential clients only, but here is the general information. If you are a potential provider, here is the basic information about the event. With Medicare requiring annual surveys of all members on alternative insurance coverage by September 1st, Medicare Advantage and PD plans need to develop their strategies now. These COB and Working Aged Surveys can be complex and lengthy for the member and operationally challenging for plans due to specific data formats CMS mandates. Learn how Silverlink and industry leaders are handling these requirements through active data management and proactive comprehensive communications campaigns that deliver measureably better results. If you’re interested, here is a link to submit your information. Brand drug = $100 less network discount plus dispensing fee less copay less rebates…let’s call it$60. Generic drug = $40 less network discount plus dispensing fee less copay…let’s call $5. You save $55 for each prescription you move to a generic. Each 1% improvement in generic fill rate = 0.75% – 1.00% reduction in pharmacy spend. First, I have to say that this is great positioning. For years, we tried to convince clients and consultants to weigh this in proposals with limited luck. So, change it to imply that it is what’s done. You would much prefer a PBM that guaranteed you that it would improve your generic fill rate by X points that simply getting a slightly better discount. Not easy. There are no apples to apples. I am not in the business anymore so I don’t have all my traditional back-up slides to cover it, but there are some simple tools that will really drive your savings. Set-up the right plan design and then communicate and promote the lowest cost solution to your patients in a convincing way that they take action. For those of you that are academics, here is a classic business school case type situation. If you are a PBM who owns their own mail, what do you do if a retailer offers you a 90-day retail rate where you could make high margins with limited costs? Don’t implement the 90-day network. This allows you to continue driving mail order, but it doesn’t allow you to make more spread on patients that don’t want to go to mail but want 90-day scripts. But, you also leave money on the table for your clients who should be saving money with the 90-day network. This is where the business model gets tangled up with the financials. Obviously, there is some optimal mix to create the best win-win, but the retailers and mail order pharmacies are often in disagreement with limited apples-to-apples data. But, while we are at it, why limit prescriptions to 90-days. Depending on the drug (i.e., maintenance, risk of abuse) and the probability of the patient not being covered, it certainly makes sense to a mail order company to offer 180-day fills (for example). From a retail perspective, you want the continuous foot traffic so longer is not better. 90-day (I believe) is only as a response to mail. It is not an optimal situation. Is Pharmacy Volume An Issue? If you read the article, it plays on the emotion of the poor kid who got the wrong medication, and the poor baby who got 5x the amount of amoxicillin and would ‘writhe in pain’ (give me a f**king break, a 16 day old baby isn’t even developed enough to know it even exists, let alone what pain is). Wah wah wah. The kid probably was colic or had some gas and was fussy. Those of us with kids certainly would care and believe that our kids feel pain. I don’t think I would trivialize someone’s individual experience like that. The USA Today article says that retail pharmacy error rates run less than 1% which seems lower than some numbers I have seen depending on what you count as an error. Is it errors reported to the state board? Is it errors that cause harm? Is it errors that are made by humans but caught by the computer system? An Auburn University pharmacy study in 2003 projected the odds of getting a prescription with a serious, health-threatening error at about 1 in 1,000. That could amount to 3.7 million such errors a year, based on 2006 national prescription volume. Obviously pharmacists are over-worked. I know the head pharmacist at my pharmacy works almost 80 hours a week year round. At some point, fatigue will influence a manual job. Additionally, I was shocked when I first realized that in many states all that is required to be a pharmacy technician is a high school diploma. They aren’t highly trained individuals although many with years of experience know a ton and are key pieces of the process. There are some efforts to require certification of technicians across states such as the Institute For The Certification Of Pharmacy Technicians. Job stress for pharmacists has been documented numerous times and given their salaries, many pharmacies push them to drive down the cost to fill (i.e., the more scripts filled divided by the salary = less cost per Rx). Daniel Hussar, a pharmacy professor at the University of the Sciences in Philadelphia, offers a more critical view. He says staffing policies have made pharmacy chains stressful workplaces. “The emphasis on speed is counterproductive. It’s an invitation for error,” says Hussar, editor of The Pharmacist Activist, an online newsletter. The time expectations for the pharmacist are very tight as USA Today reports. With a huge shortage of pharmacists and utilization of drugs going up rapidly, this issue isn’t going away. I have played with lots of these sites as they come out. 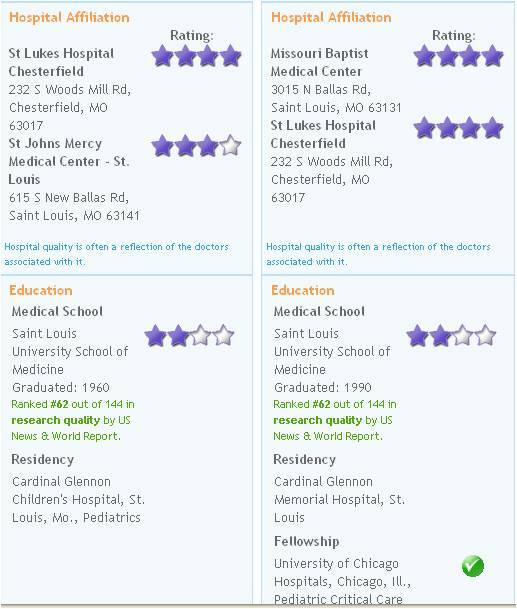 The all want to help you find a physician, compare physicians, rank physicians, etc. I received an e-mail about this new site – Vitals.com. I was skeptical at first that it would just be another me-too site. But, I was impressed at first glance. Here is a Fox Business article about them. 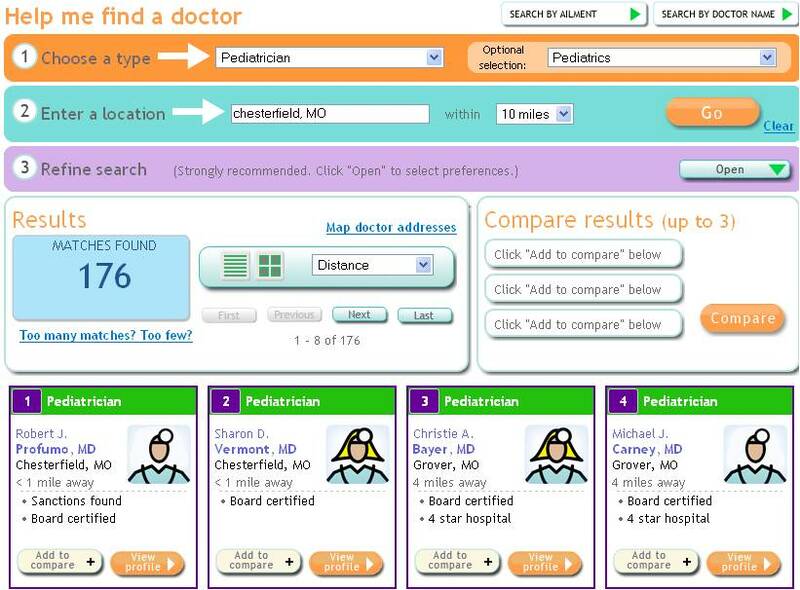 And, my favorite part is that you can compare physicians. Here are a couple of screen shots. The first two show just comparing MDs. The third is the MD find and compare feature. The fourth is the rankings that they use plus an option to include free text comments. In case there are any of you that read my blog and not Matthew Holt’s blog, he was generous enough to let me post on his blog – The Healthcare Blog (which is the #6 ranked healthcare blog). I also posted the entry – Peeling the Healthcare Onion – on this blog a few days ago. BTW – I had a post a few weeks ago where I talked about Andrew Sobol, but I could find his site. Finally, I realized I spelled it wrong and it is Sobel. His site is www.andrewsobel.com. Although I agree with the book on Don’t Sweat The Small Stuff for your personal life, I would disagree from a patient communication perspective. I believe most healthcare people dislike the word marketing. They don’t want to think about communications as marketing (which of course has some HIPAA implications if they did). But, the fact is that you are competing for mindshare and trying to get the patient’s attention to do something (otherwise you are just communicating to fulfill some checkbox). Choosing the right word. There are lots of examples of how industries and/or companies have reshaped a single word or phrase to have new meaning and new positioning. It matters. Telling stories that evoke emotion and create a call to action have power. There are the classic bad examples such as calling a car a Nova which when exported to Spanish speaking countries means “no go”. And, traditionally, a lot of our health care terms are more negative such as prior authorization or only mean something to someone in the industry such as network. Used cars have become pre-owned vehicles. Online forums have become communities. Generics have become unadvertised brands. Mail order has become home delivery. Is formulary better than preferred drug list? Determining when to communicate. Depending on your family and your conditions, it is possible that you get at least one communication per month (if not more) from some entity within the healthcare process – managed care, hospital, primary care, specialist, retail pharmacy, mail pharmacy, specialty pharmacy, pharmacy benefit manager, employer, disease management company. The reality is that you are going to pay the most attention to a communication when it is timely. For example, telling me that some group of physicians will no longer be in my network doesn’t matter to me if I don’t go to them today. When I go to choose an allergist and find out that the best one in the state is no longer in network, then it matters, but I have long forgotten that communication. Coordinating multiple channels. Thinking through a communication and where people will look for information – website, inbound IVR, live agents, employer. It is important (to optimize success) to think about how patients receive and digest information and coordinating information. Nothing is more frustrating than hearing one thing but getting a different answer in another mode of communication. Using personalized preferences. You make yourself “sticky” and create loyalty by learning about your patients…and using that in how you interact with them. What do they do with information? How do they use information? How do they use healthcare? When do they respond to calls? Do they use the Internet? It’s not easy, but it is essential. From a healthcare perspective, the industry continues to march down a path where differentiation is going to be in the way the company treats and interacts with the members and patients. Which brings me to the question of corporate DNA. Are there things embedded into the culture of a company that all things being equal make the experience or outcomes with one company different from that with another? It is an important but difficult to prove question. We did a lot of analysis at Express Scripts to try and prove this. For example, if plan design and population was exactly the same, would a company have a different generic fill rate with us than another PBM? This is where the small stuff matters. How people answer the phones at the call center. 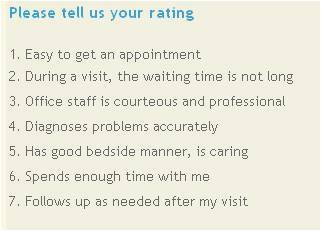 How patients perceive the company and the type of experience they have. How logic is coded in the system. Additionally, this is where I think you see the link between corporate culture and company results. Positive cultures where people love their work, enjoy coming to work, and want to make the company successful have a spillover effect on the customers. Are You Going To PBMI or Health 2.0? If you are going to either the PBMI conference in Phoenix (2/26-2/29) or the Health 2.0 conference in San Diego (3/3-3/4), I will be there. Drop me a note ahead of time or look me up when you are there. Thanks. Conceptually, I think the walk-in clinics are great. They are convenient. You go when you feel bad and don’t have to plan ahead. The copay is less than the urgent care or ER. I don’t understand the Wal-Mart branding here. They talk about wanting to have their branded clinics. They also talk about partnering with RediClinics, a Revolution Health company. They also talk about having local partners with a trusted brand (e.g., local hospitals). It says that clinics aren’t profitable and take up to 3 years to recover the start-up costs. I see the upside for Wal-Mart of foot traffic and potentially more prescriptions. What do these other constituents get? I also have to question this as a fast follower strategy (which can sometimes be a great strategy). Walgreens and CVS have both gone into the PBM market. Wal-Mart is considering the same. Walgreens and CVS have both gone into the clinic market. Will Wal-Mart acquire a company and do the same? It is also confusing that one of their vendors (for almost 25% of their clinics) went out of business due to bankruptcy and is now supposedly raising funding to re-open them within Wal-Mart. Didn’t they say earlier that they were going to be branding them as their own? If the clinic company isn’t financially stable, why are they working with them? If they already had 23 clinics that closed, why was that – no customers, wrong financials? And, why didn’t they just buy the assets to jump start their clinic model? The concept of the tipping point made famous by Malcolm Gladwell’s book is (in my words) the inflection point at which the market begins to adopt something and everyone jumps on the bandwagon. So, with CMS saying that eRx (electronic prescribing) could eliminate as many as 2M prescribing errors per year, and Congress considering a bill to link Medicare payments to use of technology, will it make a difference. (I am pulling a few of these facts from Medco’s recent announcement about launching a Medicare Part D eRx initiative.) Only 3% of physicians use the technology today, and from my experience working with the vendors and physicians, there are still several big issues. Maybe this will address some of them. Standards – Will all the payors and PBMs share some standard such that a physician can move from system to system or from office to hospital without having to relearn a new application? Can they write prescriptions for the majority of their patients from one system or have to keep using different applications? Stability – Is there a vendor that they can trust? There have been several great concepts that were either before their time or had a flawed model. Time and money wasted on a system that isn’t supported leaves a bad taste in their mouth. Workflow – Does the system fit into their current office workflow? If not, why should they change behavior? Is it less expensive and disruptive for them to have the pharmacy or PBM contact their staff to address the issues after the fact? What percentage of the 2M errors wouldn’t be caught further upstream? Incentives – What’s in it for the physician? You are asking them to do more. Division of Labor – Who has what responsibility? For the PBMs, MCOs, and pharmacies, it is great to resolve issues at the point-of-care (POC) with the physician. Drug-drug interactions. Formulary issues. Brand to generic opportunities. Retail to mail opportunities. The physician could easily get overwhelmed with all the requests and go from a quick process to a difficult process. Support – What IT responsibilities come with the system? Who is supporting it? Does it impact the rest of their practice? Does it integrate with their practice management system? If they come to depend on the solution, what happens when it goes down? Cost – Who pays – physician, MCO, PBM, pharma (not likely these days)? I know many of these are addressed in different ways today. I think we may be able to systemically force some of this into the office, but in general, until there is a generational transition in the physicians office (i.e., those in their 30s today are the high prescribers), I don’t think wide spread adoption will happen. The value is clearly there. Even looking at the pilot statistics from the Medco pilot in Michigan, you see that there are issues and opportunities which can be addressed. These don’t even take into account the handwriting issues and other safety issues which occur. When a formulary alert was presented, 39 percent of the time the physician changed the prescription to comply with formulary requirements. I personally think one of the most interesting opportunities will be to see who received a prescription and didn’t fill it and subsequently determining which of those estimated 30% of people should be filling the claim. The value of driving that initial compliance should be significant in avoiding more costly issues down the line. Unfortunately, it doesn’t work with WordPress which is my blog tool, but here is a quick screenshot of a Blidget (Blog + Widget). If you’re interested in adding this to your website or your iGoogle, you can go to Widgetbox. And, don’t forget to sign up for the e-mail updates if you are like me and want to get an updates e-mailed to you so you only check the blog occasionally without missing anything and can read the content offline. Drug utilization just keeps going through the roof. Express Scripts just updated their data in a press release today which also includes some information on regional variations (which is very interesting when you see the whole data set). 74% of people now get at least one prescription. The average number of claims per member per year is now 14.3 (which is a 30% jump since 2000). 19.32 claims per year is equal to 1.6 Rxs per month (for every person that utilizes their prescription benefit). Obviously, this is an average which some of you who use medications acutely will think is not possible. For some of you that are on 10 medications (i.e., 120 claims per year if fully compliant), you will think this is low. As discussed before, utilization varies dramatically by age. 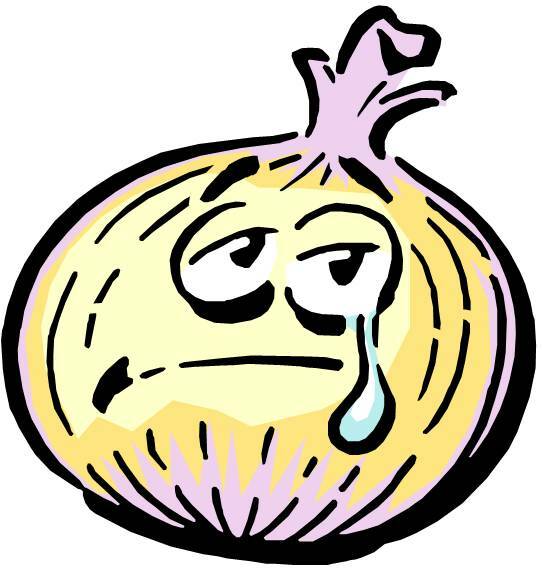 I think an onion is the right analogy for healthcare for three reasons: (1) it can make you cry; (2) every time you pull off a layer you learn more; and (3) what you see from the outside is a lot different than what you see from the inside. When you have the Congressional Budgeting Office projecting the healthcare costs will be 49% of GDP by 2082, you know things have to change. This is a front page topic almost everyday across the country. But, like an onion, if we don’t handle this right, it will make you cry out of frustration and pain. Change is not easy especially in a complex system that we have today. Finding the right mix of push and pull is going to be important. Quality is still an issue across the system. Biting a bad onion or having a quality issue with your care can make you cry. Look at the USA Today article from the other day about Too Many Prescriptions, Too Few Pharmacies or an entry on my blog about the Institute for Healthcare Improvement. Every time you pull off a layer you learn more. This applies so many ways to healthcare given our system, but I think of this from two perspectives – data / information and process. We have so much data in healthcare, but without the right model to make it into information, it just sits there. And, as we layer data (e.g., medical plus pharmacy plus lab) or integrate healthcare data with demographic data, we can learn so much more about our patients and how to care for them. This ranges from simple questions such as how to motivate behavior (e.g., cost savings versus loss avoidance) to how to deliver information based on their learning style. Every question you ask (or layer you pull off) reveals a new set of data that can be transformed into information while at the same time creating new questions. Does the relationship you found in the data simply indicate correlation or is there actual causality there? I look at the data that CVS/Caremark presented around saving 30% of healthcare costs by driving compliance and adherence and wonder why people aren’t jumping up and down trying to capture this savings. What you see from the outside is very different than what you see from the inside. There is a concept in Six Sigma about designing the process from the outside-in. Imagine sitting in the middle of the onion…all you see is onion all around you. That is a common pitfall when solving problems in the industry that we work in. We are too close to the problem and the historical solution. 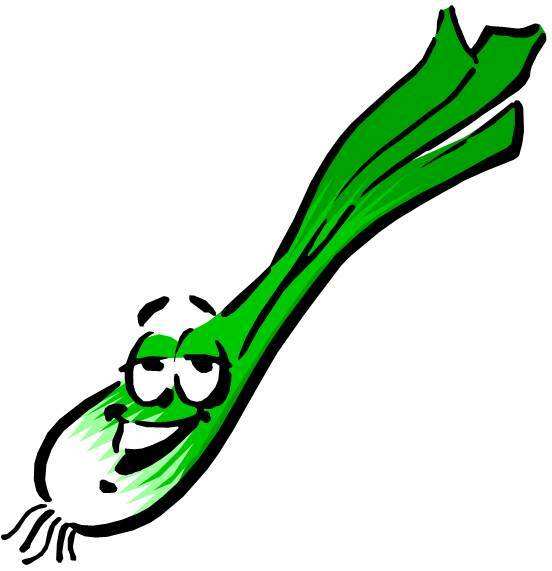 If all we see is the onion, those on the outside (our patients / members / employees) see the onion in relation to other food options. Their expectations for healthcare are produced by other companies that they interact with. They expect web solutions that work. They expect excellent service. They expect to be valued as a customer and of course need the power to walk away and chose another option. (1) Telling patients that they need a renewal (prescription). They don’t know what that means. It means they need a new refill since their original prescription refills have run out. The reality is that people are different. As you think about your healthcare process, try to be the patient. As one of my bosses used to say, give it to your grandmother and see what she thinks. Can she understand it? Can she make sense of the process? It’s not easy finding the right amount of onion to use in your recipe, but it is important to continue trying to improve. I came across a new website today for the Center for Value Based Health Management. Their definition of Value-Based Health Management is below. It is a great concept. The question always is how to do this without confusing the patient. There are lots of plan designs out there that could be used, but become so confusing that patients don’t know how to meet the payor’s goals while minimizing their out-of-pocket spend. The Health of Your Organization Begins with Your People. To Realize Total Value, You Must Understand Total Costs. Higher Costs Don’t Always Mean Higher Value. Health Begins and Ends with the Individual. Avoid Barriers to Effective Treatment. Carrots Are Valued Over Sticks. Total Value Demands Total Teamwork. The Carrots Over Sticks comment made me think of all the press about forcing wellness down the throats of employees. I have a recent article on that that I will post on later. So, I finally go into an allergist to get my allergy testing. How fun! Getting lots of pricks in your back. But, an efficient testing process. Clinically, I have no allergies. But, I noticed numerous things on the visit. First, I am a new patient, and I come in and sign my name in on a sign-in sheet that is on the counter for everyone to see. (HIPAA anyone?) I later heard one nurse asking another one why someone kept pulling the form in past the window. On the way out, there is no one to check me out. They can’t find my file. (Probably because the desk is a clutered mess.) They don’t know my copayment (which I have to tell them). Luckily, the physician had a great bedside manner and was very helpful. But, it made me wonder how we have blinders on to things that just aren’t right. Often, I think we are too close or people get detached and forget that real people have to interact with the process. Maybe every healthcare executive needs to be a patient more often and really experience it. Then our solutions would be designed from the outside-in not the inside-out.